In this time of potential Congressional legislative action on drug track and trace I think it is time to take a closer look at the specific provisions contained in the current California pedigree law regarding Federal preemption. As I recall, this language was added in the most recent update of the law, the same update that pushed it out to 2015 – 2017. It is an invitation to the federal government to create their own national pedigree regulation and, if that happens, would cause the California pedigree law to become “inoperative”, thus preempted. (1) Upon the effective date of federal legislation or adoption of a federal regulation addressing pedigree or serialization measures for dangerous drugs, Sections 4034, 4163, 4163.1, 4163.2, 4163.4, and 4163.5 shall become inoperative. (2) Within 90 days of the enactment of federal legislation or adoption of a regulation addressing pedigree or serialization measures for dangerous drugs, the board shall publish a notice that Sections 4034, 4163, 4163.1, 4163.2, 4163.4, and 4163.5 are inoperative. (3) Within 90 days of the enactment of federal legislation or adoption of a regulation that is inconsistent with any provision of California law governing the application of any pedigree or serialization requirement or standard, the board shall adopt emergency regulations necessary to reflect the inoperation of state law. (1) If the Food and Drug Administration (FDA) enacts any rule, standard, or takes any other action that is inconsistent with any provision of California law governing application of a pedigree to a dangerous drug, that provision of California law shall be inoperative. (2) Within 90 days of the FDA enacting any rule, standard, or taking any other action that is inconsistent with any provision of California law governing application of a pedigree to a dangerous drug, the board shall publish a notice that the provision is inoperative. (3) Within 90 days of the FDA enacting any rule, standard, or taking any other action that is inconsistent with any provision of California law governing application of a pedigree to a dangerous drug, the board shall adopt emergency regulations necessary to reflect the inoperation of state law. I’m not a lawyer so don’t take any action or make any decisions based on what you read here. These provisions seem to be fairly straightforward. Paragraph (a) deals with what happens if federal legislation or regulation addressing pedigree or serialization measures is adopted. If that happens, the sections of the California law that deal specifically with drug pedigrees will apparently become inoperative. Paragraph (b) deals with what happens if the FDA enacts any rule, standard or takes any other action related to drug pedigrees. In that case, any provision of California law that is inconsistent with the FDA rule, standard or other action will apparently become inoperative. The really interesting paragraph is (c), which seems to be an invitation for companies affected by the state law to seek court action against the California Board of Pharmacy if they fail to recognize when either paragraph (a) or (b) should have caused all or part of the California pedigree provisions to become inoperative. In that case a state or federal judge could apparently make the decision instead of the Board of Pharmacy. SO WHAT WOULD TRIGGER PARAGRAPHS (A) OR (B)? Of course, if Congress passes a track and trace bill and the President signs it, that would certainly invoke paragraph (a). I don’t think there would be much controversy about that. governing application of a pedigree to a dangerous drug (California statutes refer to prescription drugs as “dangerous drugs”). My mind immediately leaps to the fact that the FDA was instructed by Congress in the Food and Drug Administration Amendments Act (FDAAA) of 2007 to “…develop standards for the identification, validation, authentication, and tracking and tracing of prescription drugs” (see Section 505D. Pharmaceutical Security). Earlier this year the FDA made a public announcement that they expect to publish the first draft of their standard for tracking and tracing drugs (see my essay, “InBrief: FDA To Publish Track & Trace Standard By Year End”). In 2010 the FDA published the Standardized Numerical Identifier (SNI), which was one of the standards that were mandated in FDAAA of 2007. The full title of that document was “Guidance for Industry Standards for Securing the Drug Supply Chain – Standardized Numerical Identification for Prescription Drug Packages”, which makes it sound like it is just one in a series of “standards for securing the drug supply chain”. The FDA SNI guidance is non-binding and everyone expects their forthcoming track and trace standard will also be non-binding, but will it trigger Section 4034.1(b) of the California Business and Professions Code? Did the California Legislature intend for their pedigree provisions to be preempted by a non-binding “standard” published by the FDA? Perhaps the answer is “yes, but only the specific provision(s) that conflict(s) with that non-binding standard”. In that case maybe only the technology that is specified and the “pedigree model” that is implied within the California law could be preempted with whatever the FDA defines in their standard. That’s consistent with what I predicted could happen in my recent essay, “What If RxTEC Isn’t Adopted?”. We’ll see. This is the 100th essay of RxTrace! It’s not as lucrative as 100 episodes of a television series, but it’s a nice milestone to mark anyway. Thanks for reading everyone! Great article, Dirk. If the California BoP moves forward after PDUFA, then I smell a lawsuit to enjoin implementation of CA pedigree. What do you think? No, I don’t think that article is relevant. 2) Pharmacies will find it more difficult to forward buy inventory in advance of manufacturer price increases. Wholesalers have (almost) stopped this activity, but retailers can still engage in speculative purchasing. Adam- So $750 million is not a reason for Walgreen’s to balk at T&T? That seems to be a lot of easy revenue which would be hard to replace. It’s a different type of data (patient prescription vs. product receipt/movement), so the article doesn’t apply, IMHO. Funny. I smell the same odor. It could be the same in some T&T environments. Looking forward to reading the next hundred posts! I still don’t understand how the produce industry is more willing to tag a piece of fruit and the pharma industry fights it tooth and nail. 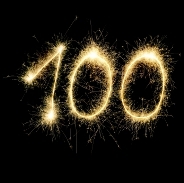 100 posts! I’m searching in vain for the “Contribute Now” button. Congratulations Dirk – that’s quite a milestone.